Clinical implications of zirconia in fixed prosthodontics: case series. 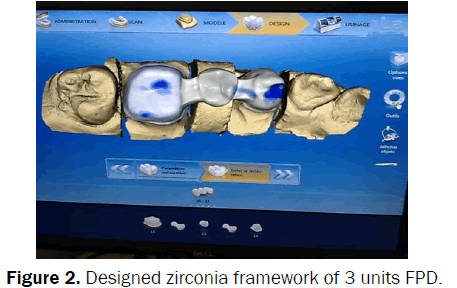 Nowadays, zirconia technology has fallen into step with computer-aided design/ computer-aided manufacturing systems that promise to transform everyday dentistry. Yttrium-oxide partially stabilized zirconia (Y-TZP) exhibits exceptional fundamental properties of great interest to dental application, such as high strength, fracture toughness, opacity, and biocompatibility. This article aims to present different clinical applications of zirconia ceramic in fixed prosthodontics, and to discuss the survival and success rate of each therapeutic modality. Metal-ceramic restoration has been used successfully in dentistry. Although it provides favorable results in terms of strength, form and function, it usually shows unaesthetic appearance from metal underneath, especially at the cervical part of the restoration or from the opaque porcelain layer . Ceramic materials, also named bioceramics, are especially developed for dental use to solve the anesthetic problems related to metal ceramic fixed dental prosthesis [1,2]. Over the last decade, zirconia technology has propelled a rapid development of metal-free dentistry that may provide material strength. The extensive knowledge gained with regard to zirconia ceramic chemistry, crystallography, and the production of these engineered ceramics led to promising and advanced dental applications . Zirconia is a polycrystalline ceramic without a glassy phase and exists in several forms. It exists in a monoclinic crystalline state at room temperature, then through sintering changes to tetragonal and cubic crystalline states . The cubic phase is stable above 2370°C and has moderate mechanical properties the tetragonal phase is stable between 1170 and 2370°C and allows a ceramic with improved mechanical properties to be obtained, while the monoclinic phase, which is stable at room temperature up to 1170°C, presents reduced mechanical performance and may contribute in the cohesion of the ceramic particles and thus of the dentistry. A smaller addition of stabilizer to the pure zirconia will bring its structure into a tetragonal phase at a temperature higher than 1000°C and a mixture of cubic phase and monoclinic (or tetragonal) phase at a lower temperature. This partially stabilized zirconia is also called tetragonal zirconia polycrystal (TZP). Yttrium-oxide partially stabilized zirconia (Y-PSZ) is a fully tetragonal fine-grained zirconia ceramic material which is made of 100% small metastable tetragonal grains at room temperature after the addition of approximately 2 to 3 mol% yttrium oxide (Y2O3) as a stabilizing agent . The remarkable mechanical properties of zirconia, already exploited in several medical applications, are mainly due to the tetragonal to monoclinic (t-m) phase transformation. The t-m transformation, which can be induced by external stresses, such as grinding, cooling and impact, results in a 4% increase of volume that causes compressive stresses. These stresses may develop on a ground surface or in the vicinity of a crack tip. It is this clamping constraint about the crack tip that must be overcome by the crack in order to propagate, explaining the increased fracture toughness of zirconia compared to other ceramics [2,4]. To summarize, the improvement of the mechanical properties due to zirconia is affected by the presence of other phases and by the metastability of the t-m transformation . In another point of view, zirconia ceramics are chemically inert materials and no local or systemic adverse reactions have been reported. No cytotoxic, oncogenic, or mutagenic effects on fibroblasts or blood cells were induced by zirconia ceramic . Y-TZP ceramics can be colored to simulate tooth structure; however, they are highly opaque . Regarding to its relative translucency, several ceramic materials were evaluated and proved that zirconia ceramics possess the highest amount of relative translucency, comparable to that of metal. Currently, colored zirconia cores are offered by some manufacturers to enhance esthetic outcomes. Different coloring agents are introduced for a better esthetic performance of the white shade zirconia frameworks. The latter can be customized in terms of form and esthetics by veneering with porcelain, through the layering or pressing technique . The high radiopacity of zirconia ceramics, comparable to that of metal alloys, enhances the radiographic evaluation of marginal integrity, removal of cement excess, and current decay, especially when intrasulcular or proximal preparations are performed [2,5]. However, there are two main drawbacks for zirconia restorations compared to metal-ceramics. The ﬁrst is a high incidence of veneering porcelain fracture, manifesting clinically as chipping fractures . The fracture mechanism of the porcelain layer (cohesive rather than adhesive) observed in these clinical studies indicates that a lack of adequate bond strength between porcelain and Y-PSZ is not the cause for this observed chipping. Other factors such as the design of the Y-PSZ frameworks, the mechanical properties of the veneering porcelain or a mismatch of the coefﬁcient of thermal expansion (CTE) between porcelain and Y-PSZ have been implicated . Raigrodski et al.,  concluded that the pressed to zirconia technique resulted in better clinical outcomes than the conventional layering technique. However, the rate of veneering ceramic chipping was not significantly higher than that of metal ceramic FPDs. The second drawback for zirconia restorations is an inherent accelerated ageing problem that has been identiﬁed to occur in zirconia in the presence of water. This ageing phenomenon is known as low-temperature degradation (LTD), which causes a decrease in physical properties by spontaneous phase transformation of the zirconia crystals from the tetragonal phase to the weaker monoclinic phase putting zirconia frameworks at risk of spontaneous catastrophic failure . In combination with CAD/CAM technique, this high strength ceramic can be conveniently fabricated from partially sintered or fully sintered blocks by avoiding conventional steps such as waxing, investing, and casting. However, machining from fully dense block requires robust milling equipment, and it is questionable for the accuracy of milling the thin section of brittle material. For partially sintered zirconia, it can be easily machined using CAM system and subsequently sintered to retrieve fully dense framework. However, large sintering shrinkage approximately of 25% needs to be compensated by calculation of software design . The aim of this manuscript is to present several clinical implications of zirconia ceramic fixed prosthodontics, and to illustrate it by three clinical situations of zirconia use from full coverage to minimally invasive restorations. A 37-years old female patient presented to the department of fixed prosthodontics with esthetic and functional demands. Her chief compliant was to replace the second right maxillary premolar which was extracted since 6 months (Figure 1). Figure 1: Lateral view showing the missing upper second premolar. A comprehensive clinical examination revealed sufficient coronal height of the abutment teeth, decayed first right maxillary molar, and healed, and well developed alveolar crest favorable to implant placement, but this therapeutic decision was declined by the patient who refused any surgical and long-lasting procedure. so, after thorough examination and with the patient consent, a zirconia full coverage FPD was decided to replace the missing tooth. For that, abutments were prepared with respect of guidelines of all-ceramic restorations. After a double gingival cord retractions, a simultaneous double mixed impression was made using light and heavy silicon C. then working cast was performed, and scanned. The frameworks was designed, milled by CAD/CAM, and checked intraorally (Figure 2 and 3). Figure 2: Designed zirconia framework of 3 units FPD. Figure 3: Intraoral checking of the zirconia framework. After color choice, the framework was veneered with feldspathic ceramic. Zirconia FPD was checked to control the gingival margins adaptation, the restoration of contact point areas, gingival embrasures opening, occlusion, shade and esthetics. After ceramic glazing, zirconia FPD was cemented with glass ionomer cement modified with adjunction of resin (Figure 4). Figure 4: Esthetic and biological integration of the final restoration Regular appointments were programmed. A 24-year-old student with unremarkable medical history presented at the department of fixed prostheses in the dental clinic of Monastir requesting for phonetic and esthetic problems related to resin veneered splinted crowns cemented since few months. Furthermore, the patient reported that the resin metallic restorations caused periodontal pathologies with bleeding gingiva. Intraoral examination showed too long crowns not included in the anterior occlusal plan with buccaly located incisal edges. The failure analysis reported a defective shape of restorations with pronounced biological contours, and closed embrasures. Moreover, the lighter shade with smooth surface and diastema persistence confirmed the esthetic failure. The defective shape was aggravated by the bluish margins due to the metallic collars. Periodontal examination showed a biological failure remarked by gingival inflammation and papilla hypertrophy. In addition, the inflammation was surely aggravated by the luck of hygiene (Figure 5). Figure 5: Intraoral view showing defective resin veneered restorations. As far as function is concerned, the patient had occlusal and phonetic problems, related to the increased overjet and overbite forbidding a functional anterior guidance as the dynamic amplitude was exaggerated. Radiographic examination revealed favorable root-to-crown ratio of abutments, and sufficient endodontic treatment in the left central incisor. As a matter of fact, the restoration required its replacement with zirconia core two single crowns. For that, defective restoration was removed, and a multidisciplinary treatment was achieved to give favorable tooth structure to the abutments (Figure 6). Figure 6: Prepared and restored abutments after multidisciplinary treatment. Then, a master impression was made, and sent to the laboratory to be treated. The working cast was scanned, and zirconia cores was designed and milled by CAD/CAM, then checked intraorally, veneered with felspathic ceramic, and finally cemented (Figure7). Figure 7: Final restorations: showing suitable width-to length crown ratio, diastema closure, color and texture in harmony with the adjacent teeth. A 14-years-old girl with congenitally missing lateral incisor was referred to the clinic of dental medicine. Her medical history was unremarkable. Her chief complaint was the replacement of the agenesic right lateral incisor. Her dental history revealed an orthodontic treatment aimed to the space opening followed by bone grafting for implant placement which was rejected (Figure 8). Figure 8: Intraoral view showing the missing lateral incisor with the rejected bone graft. As the occlusal bite in the anterior teeth was located in the 1/3 incisal of the palatal surface of maxillary teeth, and the sufficient coronal length of the abutments which were vital, and aligned, the indication of resin bonded bridge was retained. Due to the occlusal scheme and the canine guidance, the impact point was identified using articulator paper, and the limits of preparation were localized just behind these impacts. Central incisor and canine were prepared (Figure 9). Figure 9: Prepared abutments declining the occlusal impacts. A complete arch impression was made with a silicone impression material, then was transferred to the laboratory to be casted. The master cast was checked, the limits of prepared surfaces were marked. Then, the model was referred to the technician to be scanned. Finally, a zirconia based framework was fabricated by CAD/CAM (figure 10). Figure 10: The framework of zirconia resin bonded fixed partial denture (Z-RBFPD). At the initial trial, complete seating of prosthesis marginal adaptation, form of the pontic, and tissue contact were assessed (Figure 11). Figure 11: Intraoral checking of the Z-RBFPD’s framework. Subsequently, veneer porcelain was added the resin bonded bridge was checked again intraorally. Finally, the resin bonded bridge was cemented using bonded cement after isolation of the teeth with a rubber dam and sandblasting of the internal surface of the frameworks (Figure 12). Figure 12: Lateral view showing the Z-RBFPD after bonding.The patient was instructed to clinical recalls every 6months. Contemporary zirconia technology contributes to the fabrication of new biocompatible all ceramic restorations with improved physical properties for a wide range of promising clinical applications. Based on the exceptional mechanical properties of zirconia (high flexural strength and fracture resistance), Y-TZP is the most recent framework material for the fabrication of all-ceramic FPDs either in anterior or posterior sites.8 Zirconia ceramic FDPs exhibited a similar survival rate to metal-ceramic FDPs at 3 years of function . These findings were comparable to those of Schmitt et al. who showed 100% survival rate of zirconia FPDs with good biological integration no significant differences were observed between the periodontal parameters of the test and control teeth) . Therefore, Sailer et al. reported in a 3-year clinical study that the survival rate of zirconia FPDs was about 84.8% and thus due to the replacement of seven FPDs because of biological and technical problems . For a period of 5-year follow-up of zirconia FPDs, Sailer et al. showed a decrease of the survival rate which has been equal to 73.9% . An increase of the percentage of secondary caries was also noted from 10.9 to 21.7% respectively from 3 to 5-year study [11,12]. A major disadvantage of zirconia FPDs was chipping which was observed in all the studies mentioned [10-12]. A decrease of the success rate from 100% to 97.8% respectively from 3 to 5-year study was also remarked, thus due to the fracture of 5-units FPDs . The most utilized zirconia in dentistry, Y-TZP, has been found to withstand cyclic fatigue testing, where posterior all-ceramic FPDs spanning up to 5-units, had a lifetime comparable to that achieved with metal- ceramic restorations, and it has been predicted, based on the results of this study, to have a lifetime longer than 20 years . Zirconia-based FPDs may exhibit a good long-term prognosis if connectors are properly designed and fabricated. Calculations, based on the fatigue parameters, indicate that connector dimensions should be at least 5.7 mm2, 12.6 mm2, and 18.8 mm2, for the fabrication of a 3, 4, or 5-unit FPD, respectively. Moreover, a minimum diameter of 4.0 mm for all-ceramic zirconia-based FPDs with long spans or replacing molars has been recommended . To conclude, zirconia offers a reliable treatment option for medium-term clinical as a framework material for 3 and 4-unit anterior or posterior FPD’s. Therefore, the fit of the frameworks and veneering ceramics should be improved [10-12]. The zirconia restorations most often described in the literature are FPDs rather than single crowns, although crowns constitute the most common fixed prosthodontic treatment. Single or multiple crowns can be indicated for anterior or posterior teeth. 3-year retrospective follow-up reported a survival rate of 93% of single crowns fabricated with Procera zirconia† in a private practice setting [6-13]. A 3-year follow-up study of 463 zirconia core crowns single and multiple crowns supported by implants and natural teeth) showed that three of the zirconia prostheses suffered fractures in more than three units (11 crowns), and the cumulative prosthesis survival rate was 98.2%. Twelve units lost retention and were re-cemented, and no secondary caries of the abutment teeth were reported. However, the prevalence of secondary caries, which was reported by Sailer et al in zirconia FPDs and Tartaglia et al. in zirconia single crowns after 3-year follow-up, may be related to their marginal gap. Anunmana et al. concluded that all the marginal gaps were less than 120 microns, which is clinically acceptable for the system used in this study. However, the measured gaps tended to be greater than those of the parameter set by CAD system especially at the occlusal area. In addition, the fit of zirconia substructure was also affected by the dimension of the restorations in which the gaps of bridge substructure was larger than those of single-unit substructure. So, the zirconia-core crowns appeared to be an effective clinical solution as they had favorable functional and esthetic properties . From an esthetic point of view, the increased opacity of zirconia ceramics can be very useful in esthetically demanding clinical situations, as for example in cases of masking dischromatic abutment teeth or metal posts and cores. Zirconia frameworks, due to their high density, and homogeneity even with limited core thickness (0.5 mm) provide an adequate level of opacity, which offers adequate masking of underlying discolored abutments and permits a controlled depth of translucency after veneering . It is assumed that, due to the inherent opacity of the zirconia core, the clinical application of zirconia bilayer veneers may offer a high-strength veneer restoration with better masking ability for a given discoloration. Bilayer zirconia veneers showed improved color performance on discolored teeth . Because of their noted advantages including their strength, zirconia oxide ceramic can be milled in fine details which allow their indication as a minimally invasive restoration: bilayer veneers, zirconia resin bonded fixed partial denture (Z-RBFPD), and inlay retained zirconia fixed partial denture (IRZFPD). The Z-RBFPDs are considered as a viable alternative to complete coverage and are considered as less invasive treatment option for both anterior and posterior regions. They allows to eliminate undesirable incisal graying frequently observed with metal RBFPDs [8,15]. Regarding inlay-retained zirconia FPDs (IR-Z-FPDs), compressive mechanical testing showed high fracture resistance. Considering the maximum chewing forces in the molar region, it was proposed that the connector size should be between 9 and 16 mm [2,8]. Even when the high-strength core material zirconia ceramic was used for IRZFPDs, but without the modification of additional retainer-wings, more than 20% failures like debonding and framework fractures occurred during an observation time of only 12 months . In order to improve strength performance of IRZFPDs, clinical trials indicated new preparation and framework designs with the following main features: preparations were performed in accordance with general principles for ceramic inlay restorations and modified with a retainer-wing bevel preparation in the enamel at the buccal and oral sides. Conversely to Z-RBFPDs, long-term clinical studies on IRZFPDs are needed before their extensive clinical application [8,16]. Anunmana C, Charoenchitt M, Asvanund C. Gap comparison between single crown and three-unit bridge zirconia substructures. 2014; 6: 253-258. Vagkopoulou T, Koutayas SO, Koidis P, Strub JR. Zirconia in dentistry: Part 1. Discovering the nature of an upcoming bioceramic. 2009; 4: 130-151. Raigrodski AJ, Hillstead MB, Meng GK, Chung KH. Survival and complications of zirconia-based fixed dental prostheses: a systematic review. 2012; 107: 170-177. Guazzato M, Albakry M, Ringer SP, Swain MV. Strength, fracture toughness and microstructure of a selection of all-ceramic materials. Part II. Zirconia-based dental ceramics. Dental materials. 2004;20:449-56. Cavalcanti A, Foxton RM, Watson T, Oliveira M, Giannini M, et al. Y-TZP ceramics: key concepts for clinical application. Operative dentistry. 2009;34:344-51. Al-Amleh B, Lyons K, Swain M. Clinical trials in zirconia: a systematic review. 2010; 37: 641-652. Guazzato M, Walton TR, Franklin W, Davis G, Bohl C, et al. Influence of thickness and cooling rate on development of spontaneous cracks in porcelain/zirconia structures. 2010; 55: 306-310. Koutayas SO, Vagkopoulou T, Pelekanos S, Koidis P, Strub JR (2009) Zirconia in dentistry: part 2. Evidence-based clinical breakthrough. 2009; 4: 348-380. Sailer I, Gottner J, Känel S, Franz Hämmerle CH. Randomized controlled clinical trial of zirconia-ceramic and metal-ceramic posterior fixed dental prostheses: a 3-year follow-up. International Journal of Prosthodontics. 2009;22:553. Schmitt J, Holst S, Wichmann M, Reich S, Gollner M, et al. Zirconia posterior fixed partial dentures: a prospective clinical 3-year follow-up. 2009; 22: 597-603. Sailer I, Fehér A, Filser F, Lüthy H, Gauckler LJ, et al. Prospective clinical study of zirconia posterior fixed partial dentures: 3-year follow-up. 2006; 37: 685-693. Sailer I, Fehér A, Filser F, Gauckler LJ, Luthy H, et al. Five-year clinical results of zirconia frameworks for posterior fixed partial dentures. International Journal of Prosthodontics. 2007;20:383. Ortorp A, Kihl ML, Carlsson GE.A 3-year retrospective and clinical follow-up study of zirconia single crowns performed in a private practice. 2009; 37: 731-736. Tartaglia GM, Sidoti E, Sforza C. A 3-year follow-up study of all-ceramic single and multiple crowns performed in a private practice: a prospective case series. 2011; 66: 2063-2070.